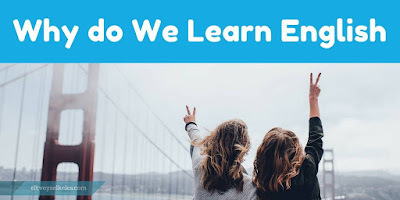 Home featured ideas Why Do We Learn English? This is the question we all face when we enter a classroom with some youngsters who are always curious about "why English speakers don't learn our native language?" They keep saying "I want them to learn my language and i don't want to learn theirs". They really wonder about that and hardly understand why it is otherwise. But no worries, I have found a TED Talk about this issue explaining it in less than five minutes; special thanks to my best friend Hakkı. This video is a must-see for every English teacher and learner and i suggest you let your students watch it and discuss about the reality behind it. I hope it'll be fun and an inspiring lesson. English is became now an International language, that is the reason people are looking for english tuition tutors. Many offices has been declared that no one will be speak in any other language, English is first priority. However, if you do choose to study English, then there are simple exercises that you can follow to make learning easier.